UFC’s return to Brazil came with a loaded card full of stoppages, knockouts and submissions. In the main event, Thiago Santos defeated Eryk Anders by TKO after the third round once Anders was unable to continue fighting, closing a show that had a total of 10 fights end by knockout or submission. The fight between Santos and Anders saw a lot of action, first from Santos who managed to get Anders on his back and was looking to end the fight with some ground-and-pound offense. After both men got back up, they briefly exchanged strikes with each fighter landing clean punches to each others. Santos momentarily hurt Anders late in the second round, but was not able to finish off Anders. Santos then unloaded numerous big kicks to Anders’ legs and head and even stunned him at times. Nearly halfway through the third round, Santos hurt Anders with a series of strikes, but Anders managed to hang on to dear life and seemingly survive the round. But as the round ended and both fighters were getting to their corners, Anders struggled to get up from the mat and immediately collapsed, unable to even get to his corner under his own power. As such, the fight was called off and Santos was named the winner. The event was originally supposed to have a completely different main event, with Glover Teixeira facing Jimi Manuwa. Teixeira suffered an injury in August and was then replaced by Santos. Once Manuwa got hurt the week before the fight, Anders came in at the last second to salvage the main event. The co-main event saw Charles Oliveira return to his home country of Brazil and made quick work of Carlo Perdersoli. Oliveira landed a counter right hand to Pedersoli, who immediately went down. Oliveira would keep hammering away at Pedersoli until the referee stopped the fight, marking the quickest knockout victory in Oliveira’s career. This is Oliveira’s second straight win in the octagon since losing a fight against Yancy Medeiros last year at UFC 218. In perhaps one of the feel-good moments of the night was the triumphant return of Antonio Rogerio Nogueira. 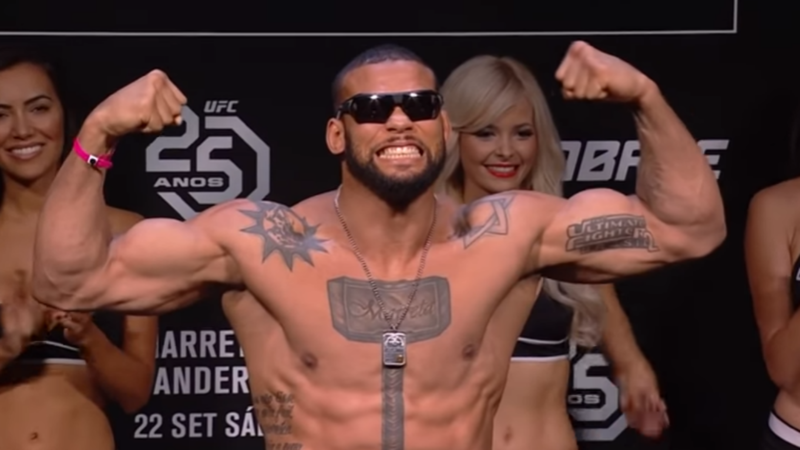 Nogueira knocked out Sam Alvey early in the second round of the fight in what ended up being a straight boxing match with both fighter getting their chances to land big punches to each other’s head. This was the first time the 42-year-old Nogueira has fought since losing a rematch to Ryan Bader in November 2016 and it was the first time Nogueira won a fight in the octagon since his TKO victory over Patrick Cummings back at UFC 198.